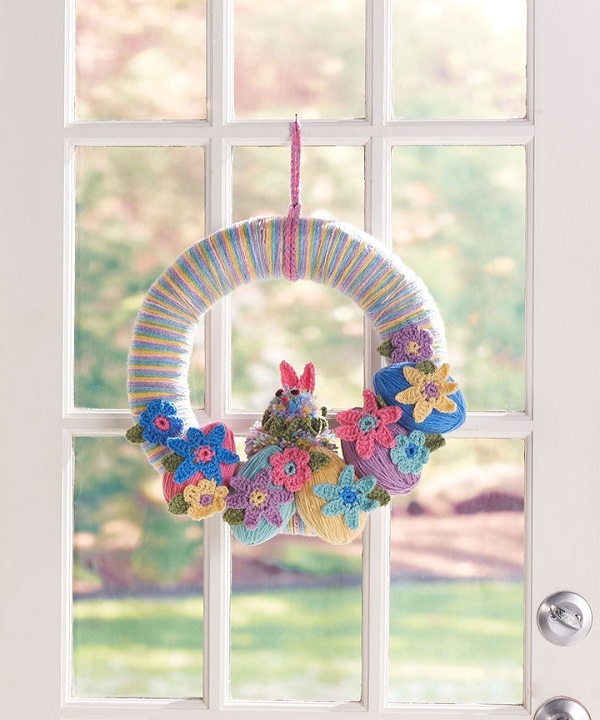 Celebrate the Easter season with a colorful wreath! Crochet the flowers, leaves, bunny ears and collar to embellish the pompom bunny and easy-wrap eggs. GAUGE: 5 sts = 1″ [2Â½ cm]. CHECK YOUR GAUGE. Use any size hook to obtain the specific gauge. For easier wrapping, make 3” [7.6 cm] balls of yarn of each color for the Styrofoam eggs and a 4” [10 cm] ball of yarn for the wreath. If using a straw wreath, leave the plastic wrap on the wreath for easier wrapping. With A, evenly wrap yarn around the entire wreath. Weave in a 3” [7.6 cm] tail on the back. Wrap 5 eggs with colors B, C, D, E and F.
Tightly wrap the eggs vertically around until the Styrofoam is covered. Weave in a 3” [7.6 cm] tail on the back of the egg. When the wrapping is done, to keep yarn in place at the top and bottom of the egg, add a very small amount of white glue under the top strands of yarn. Insert a stem wire through the back of the each egg vertically. Attach the eggs to the wreath off center, in a row, with the stem wire by winding the stem wire around the wreath and twist tightly on the back to secure. Trim the wire and poke the loose ends into the wreath. Add some white glue under the eggs to secure them in place to the wreath. With A, make a 1” [2.5 cm] pompom for the head and 2” [5 cm] pompom for the body. Tie the head to the body. With G, ch loosely to fit around neck of Bunny. Row 1: Dc in 3rd ch from hook, *3 dc in next ch, rep from * across. Fasten off, leaving long tail. Using long tail, tie Ruffle Collar around Neck of Bunny and trim. Row 1: Sc in 2nd ch from hook, sc in next 2 chs, hdc in next 2 chs, sc in next ch, 3 sc in next ch, working in remaining loops on opposite side of ch, sc in next ch, hdc in next 2 chs, sc in next 3 sts, slip st in first st. Fasten off, leaving long tail. Using long tail, attach each ear to top of Bunny head. Cut 2 circles each of black and pink felt. Position black felt slightly off-center over top of pink felt. Glue black felt in place. Glue each assembled Eye to Bunny head. Cut out a small triangle of pink felt. Center below Eyes and glue to Bunny head. Round 1: 6 sc in 2nd ch from hook, slip st in first st. Fasten off. Round 1: Join different color yarn to any st on Center, ch 1, (sc, ch 3, dc, ch 3, sc) in same st as join, *(sc, ch 3, dc, ch 3, sc) in next st, repeat from * 4 times. Fasten off, leaving an 8” [20 cm] tail. Use tail to sew Flowers to wrapped Eggs. Weave tail in back of Flower. Round 1: Join different color yarn to any st on Center, ch 1, sc in same st as join, *ch 6, sc in 2nd ch from hook, hdc in next ch, dc in next 3 chs, sc in next st on Center, repeat from * 4 times, ch 6, sc in 2nd ch from hook, hdc in next ch, dc in next 3 chs, slip st in first st. Fasten off, leaving an 8” [20 cm] tail. Using tail, sew flowers to wrapped Eggs. Weave tail in back of flower. Row 1: Sc in 2nd ch from hook, sc in next ch, hdc in next ch, dc in next ch, hdc in next ch, 3 sc in next ch, working in rem loops on opposite side of ch, hdc in first ch, dc in next ch, hdc in next ch, sc in next 2 chs, sl st in first st. Fasten off, leaving long tail. Using long tail, sew 1 Leaf to back of each Flower. Weave in loose ends. Before attaching the flowers, pin the flowers in place arranging different sizes and colors. This will allow you to decide what sizes, colors go well together. Once you have decided on your design take a digital picture for reference. Attach the flowers by sewing the back of the flower to the yarn wrapped on the eggs and wreath. Add a small amount of white glue to hold in place. Trim and weave in loose yarn. With 2 strands A, ch 80, slip st in 80th ch from hook. Wrap the connected chain around the wreath and pull the front end through back end of the circle to make a hanging loop. Attach Bunny to the wreath, behind the eggs by threading a stem wire through the body and then wrapping the stem wire around the wreath securely. Trim the excess wire and poke into the wreath. 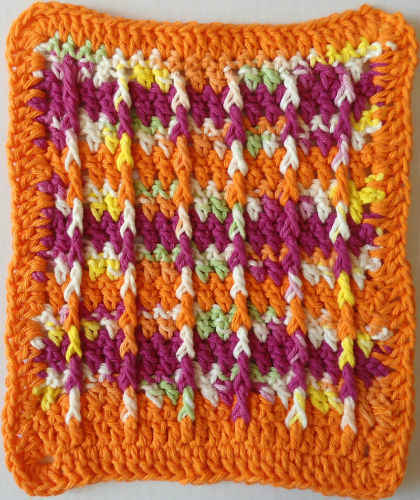 ch(s) = chain(s); dc = double crochet; hdc = half double crochet; mm = millimeters; sc = single crochet; sl st = slip stitch; st(s) = stitch(es); tr = treble crochet; yo = yarn over; [ ] = work directions in brackets the number of times specified; * or ** = repeat whatever follows the * or ** as indicated.